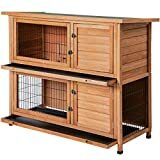 Interested in the Merax Rabbit Hutch Wooden House Wooden Cage for Small Animals (Rabbit Hutch#1)? Is the price too high? You can easily price watch this product and we'll notify you when the price reaches your target.